Yardley, PA - Yardley Products Corporation, a manufacturer of precision engineered threaded metal insert fasteners, announced today it is offering inserts manufactured using a "non-magnetic" brass material. Ideal for applications in the electronics and medical device industries, the "non-magnetic" brass material is available in all styles of Yardley inserts that are currently offered in regular brass. "Most users are probably not aware that standard brass inserts are actually slightly magnetic due to small traces (about .2 - .4%) of iron in the alloy", said Tim Bailey, president at Yardley Products. "Thus numerous applications today are now requiring the use of non-magnetic inserts in order to minimize potential RF interference with sensitive electronics." The non-magnetic characteristics (zero magnetic flux density) of the Yardley "non-magnetic" brass insert material offers manufacturers the same high quality Yardley threaded inserts in a completely non-magnetic material for use in products that contain or are used near sensitive electronics. Typical applications include medical instruments; MRI (magnetic resonant imaging) machines; microwave and cell phone towers; semiconductor protection equipment and devices, aircraft; and spacecraft; robotic assemblies; instrumentation devices; printers/plotters; and laboratory and test equipment. One recent application involved inserts that were molded into the beds of MRI machines. Produced on a custom quote basis, Yardley "non-magnetic" threaded metal insert fasteners are available in a wide range of U.S. and metric sizes and thread configurations. 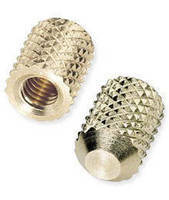 In addition to "non-magnetic" brass inserts, Yardley Products manufactures a full line of standard and custom press-in, molded-in, epoxied-in, self tapping, ultrasonic, and thermal insert fasteners in aluminum, brass, diecast. plated steel, stainless steel and steel. Yardley "non-magnetic" brass inserts are available for quote online at www.yardleyproducts.com or by contacting Yardley Products toll free at 800-457-0154. Yardley Products is a manufacturer of precision engineered threaded metal inserts for a wide range of fastening applications. Yardley inserts feature designs that "lock" them securely into plastic, metal or wood base materials. Inserts are available for a variety of installation methods including molded-in, pressed-in, threaded-in, thermal, and ultrasonic vibration. Yardley Products offers a large inventory of more than 24 million inserts, fast delivery, and provides insert design and custom manufacturing.